The cooking method I describe below is one I use all the time when cooking fish. It’s quick, easy and almost fool-proof! This recipe also works with halibut or rockfish. I’m sure it would work with pretty much any fish…so try it with whatever your favorite is! I’m lucky in that my Dad likes to go to Alaska every year to fish for salmon and halibut. I end up with a freezer full of amazing fish to work with. If that’s not what your Dad does, don’t fret, I’ve also bought frozen salmon and halibut at Trader Joe’s and Costco, and both are pretty good. Put the salmon skin side down and let it sear well, about 5 minutes. Turn the heat down to simmer and add the wine. Cover. Let it poach/steam for about 5-7 more minutes. The cooking time varies on how thick the filets are and how you like them cooked. I like them with a little pink left in the middle. When they’re done, pull the salmon out onto your serving platter, cover with the skillet lid to keep warm. Add the remaining ingredients to your skillet and reduce for about 3 minutes. Just long enough to warm everything and let the gorgonzola melt into the wine. You want the tomato and green onion to stay pretty fresh. Pour the sauce over the salmon and serve! I think you’re really gonna like this one! 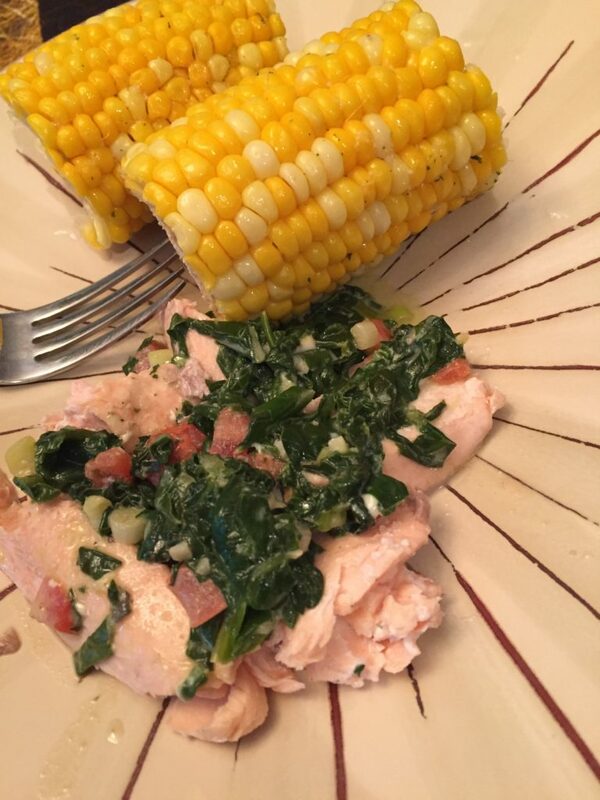 I love salmon but it stinks up the house when I cook it according to my husband, does it smell like fish in your house when you cook it? How can we elimate that? I had used a steamer to cook my vegetables and toot the pan out side and put the salmon in the water until done and it was good, another alternative. To me, it doesn’t smell like fish. But I always run the stove fan and open the window just in case! I like your idea, though…very creative of you!